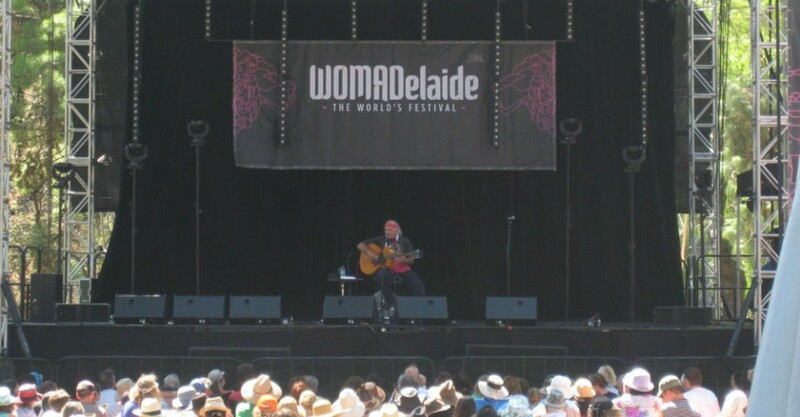 The final stanza of this year’s WOMADelaide takes place under blue-ish skies; it is warm without being too hot. I’ve made the effort to arrive relatively early, as I want to catch Spiro’s 1pm session. There’s lots of space in front of the Foundation Stage, and I sprawl out on the grass, counting my musical blessings. The crowd builds, the music starts, and Day Four is underway. Spiro play English folk, something that appears to be growing in stature and popularity, and it is easy to see why. The music is simple and repetitive in terms of chord progression, and this creates a canvas upon which layers of intricate melodies can be painted. It’s easy to get swept away in the splendour. Jon Hunt, the band’s acoustic guitarist, quite obviously is. He struggles to get some of the song introductions out, as he is overcome by the joyous nature of the music he is helping to create. It’s a wonderful thing to witness, and it captures the essence of all that is good about WOMADelaide in those few moments. Spiro put on a great set, and I mentally commit to hearing more of this band. I head up to the Morton Bay Stage, to catch Newfoundland folk trio The Once. Geraldine Hollett’s voice is lovely to listen to; in fact, the vocal performances are strong across the board. The band plays some strong original songs, telling their stories by way of introductions, and throws in a couple of covers for good measure. As I make my way to the Zoo Stage I pass both Savina Yannatou & Primavera en Salonico and Quarter Street. Both sound great; it’s a shame I can’t be in three places at once. Debashish Bhattacharya’s all-seated concert is a treat for the ears. Anandi Bhattacharya provides some beautiful vocal work, and the tabla is exquisite, but the showpiece is the instrumental work of Bhattacharya himself. Using the guitar that he has created, he presents a marvellous fusion of Indian and western sounds. Marlon Williams & The Yarra Benders play to a decent-sized crowd on Stage 2. Even after four days (for some people) it’s great to see such a level of enthusiasm for an act. This band packs a decent bluegrassy punch. Williams has a great voice and is no slouch on guitar either, so his solo spots don’t lessen the mood of the show. The sky is the limit for this fellow and his band. The tight, funky jazz (or is it jazzy funk?) of Japanese outfit Mountain Mocha Kilimanjaro play at 5pm on the Foundation Stage. It’s easy on the eye and ear, and seems to fit the mood of those listening. These guys look like they’ve been doing this all their lives. Very well drilled. I catch John Grant on Stage 2 and it’s easy to see why people are talking about him. Lyrically, he’s constantly interesting, and his keyboard driven music is something a little different. Unfortunately, I can only see half of his show as I also want to see Songhoy Blues on Stage 3. It’s a worthy sacrifice though, as these guys are also very impressive. Playing their desert blues, it is a terrific combination of African voice and searing bluesy-rock guitar. The big crowd are happy to bounce away through the set, as the shadows of late-afternoon make themselves known. Seun Kuti & Egypt 80 put on a colourful, groovy show on the Foundation Stage. Despite the beats and grooves, the audience seems intent on listening to the music rather than dancing; perhaps they are starting to feel the event catching up with them. Whatever the reason, the band is very much appreciated by those in attendance. My 2016 WOMADelaide adventure concludes with a performance from the Australian Dance Theatre. The Beginning Of Nature is a sight to behold, and the Zephyr Quartet is eminently listenable. As the curtain comes down on the visually striking show, I decide that this is an appropriate end point for your heavily-sated correspondent.